Laura Vert is the Senior Grants Specialist at CUSP. 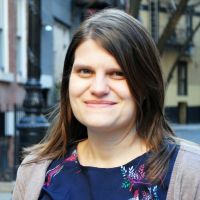 She previously worked as the Development Director of the NYU Furman Center, an interdisciplinary research center focused on housing and neighborhoods. Prior to that, she was the NYU Furman Center’s Fiscal and Grants Manager. She also previously worked as the Administrative Manager at the Brooklyn Autism Center, a non-profit school that provides behavioral therapy and educational services for students with autism. In this position, Laura was focused primarily on financial and human resource management, but also worked in the areas of fundraising, strategic planning, special events and marketing. Laura holds a B.A. in English and American Literature from New York University’s College of Arts and Sciences and an M.P.A. from CUNY Baruch College’s School of Public Affairs.